As always, our salon can provide you with our personal service for creating the perfect custom hair replacement system or extensions to ensure the best look and fit. 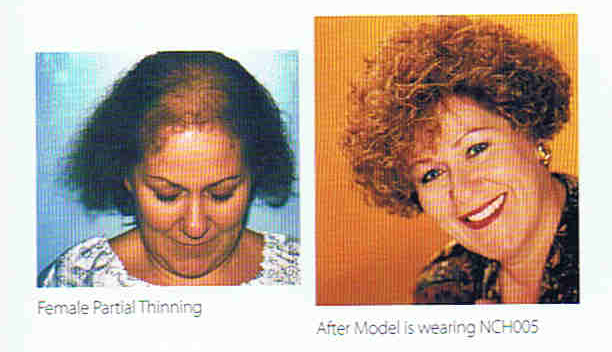 If you experience Female Pattern Baldness which usually affects the front and crown area, then our Top of the Head Partial Systems are the perfect solution for your type of thinning problem. This very common type of hair loss affects over 20 million American women today. Our Top Partial System are truly the answer to women who have 25-100% hair loss on the front, top and/or crown of the head. These systems can either be taped or clipped onto your own hair, then cut and blended into your existing style or choose a new style! These hair systems are made with 100% of the most beautiful, highest quality human hair and come in either 8” or 14” in length. They come in all of our colors and textures. Top Partial Systems are pieces that are a stock item and usually ship within 5 days of ordering. If you have 25-50% hair loss we recommend using clips to hold your Top Partial System in place. If you have extensive thinness in the very front you can tape the very front part of the system to your scalp and then use clips on the back and sides. If you choose to use tape in front, you must clip any thin hairs down to the scalp in order for tape to hold securely. Clips are best placed on the underneath side of system at 3,6,& 9 o’clock (as if you were looking at it like a clock.) This method is secure and comfortable. For clients with 75-100% hair loss we suggest clipping all of your thinning hair down to ¼” from the scalp and using our double sided tape around the entire perimeter of the system. This provides the most secure fitting and the most natural look. No more worrying about your hair blowing off or sliding forward or looking crooked. This method provides the most secure and comfortable fit. Always shampoo hair pieces off the head holding the piece by the front and gently cleansing without excessive rubbing. Rinse well and apply conditioner combing through. Rinse conditioner and then towel dry. Comb into place and blow dry on low setting or air dry if possible. These gorgeous wigs can be cut in any shape and styled with hot rollers, curing irons or flat irons. Always use low settings for curling irons and flat irons and NEVER GO TO BED WITH THE HAIR WET OR DAMP!!! For the most natural look we strongly recommend you place your top system on your exact front natural hairline. Placing the system lower than your natural hairline (towards your nose) looks wiggy and unnatural. Placing it too far back will expose bare spots. It makes all the difference in the world. We want you to look great!